If you are a nature-lover, Laos must be a perfect spot to visit. This beautiful country is still in the process of commercializing and there are so many natural sites that haven’t been discovered yet. You will see majestic mountains, impressive waterfall, long river, broad plateau, etc. A lot of breathtaking scenes are shown right in front of your eyes, which will definitely makes you amazed and impressed. So why not take a chance to visit Laos and enjoy the natural beauty – a gift from the God! 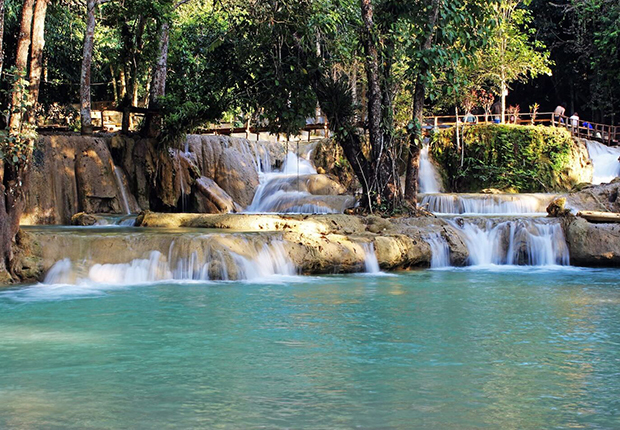 Located in the south of Luang Prabang – the form capital of Laos, Kuang Si Fall is must-see sites for everyone. It is the largest waterfall in Luang Prabang flowing through a limestone jungle and falling into three tiers, which looks like three step on the way heading to the top of the mountain. The name “Kuang Si” is originated from a story in the past. People said that an old man has digged into the earth in the search of water. Unfortunately, the place where he is digging is the house of a deer. That area is also the location that Kuang Si Fall is situated right now. Therefore, they name it “Kuang Si”, Kuang is deer and Si means dig in Laotian. Once you have arrived in Kuang Si, I’m sure you will be speechless when first seeing this man-made scenery. It looks like a masterpiece: waterfall smoothly, the atmosphere like a call from nature, crystal-clear water in the pools. In a hot and humid day in the summer, nothing is better than a swim in the blue water to relief all the heat and to relax as a gift for your body. This area is not only special for the fall but also for the surrounding area. Nearby, there is house of Asian Black Bear which has been rescued from the poachers. Moreover, in this forest, you can have a chance to meet locals, especially Hmong ethnic group, they live inside the forest. Notice: It is most suitable for adults since the area is quite slippery. Be careful if there are children in the area. Unlike Khuang Si – a natural part in Luang Prabang, Vang Vieng is a whole new land for combination of natural scenery and sport. Three most popular activities usually be done here are kayaking, tubing and caving. This special feature also explains partly why Vang Vieng is a town of backpackers with many adventurous activities. 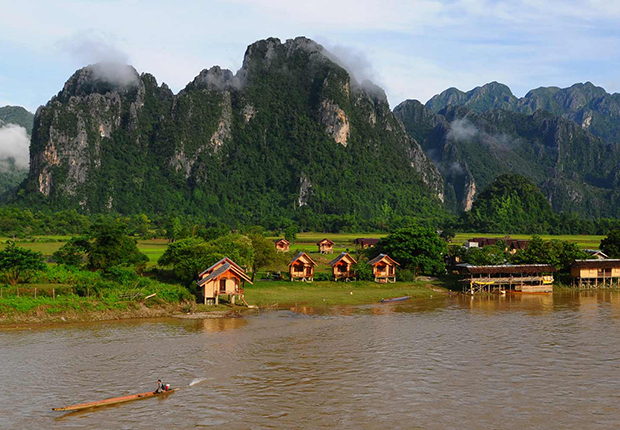 Vang Vieng lies next to Nam Song River, which contributed to the creation of kayaking. Tham Nam Cave is perfect for tubing inside and sightseeing, and together with many other caves in Vagn Vieng such as: Tham Phu Kham Cave, Tham Chang Cave, Lusi and Pha Poak Cave it makes up caving activities – a way to challenge your physical strength. Another natural site in Southern part of Laos, Bolaven Plateau is famous for two things: coffee and Tan Fan waterfall. Most of plateau is located in Champasak Province between the Annamite Mountain Range and the border with Vietnam and Cambodia. There are countless coffee plantation and they even show you the process of making coffee from the very first step to the finished good. There are also several waterfalls in Bolaven Plateau for you to admire and the most impressive is Tan Fan Waterfall. Tan Fan can be considered as the highest waterfall in Laos, over 100 meter-high falling down with two main streams. The wildlife around the waterfall is also diverse with the presence of leopards, tigers, elephants, monkeys, etc. 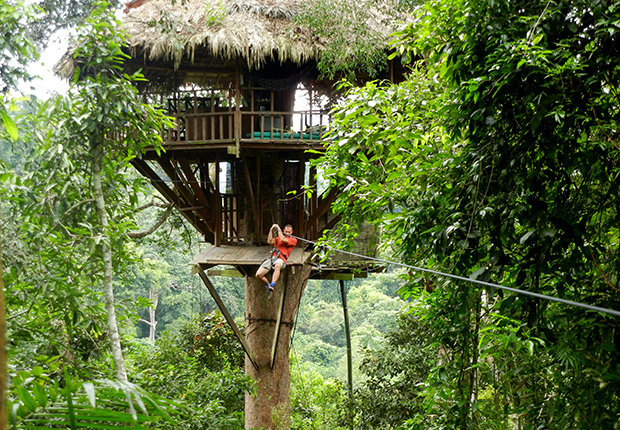 The panoramic view is amazing and breathtaking with the strong presence of natural scenery and wildlife. 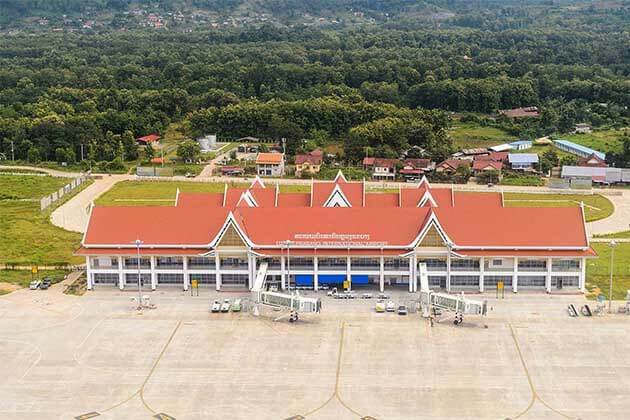 Huay Xai is the center city Bokeo, one Laos Province near the border with Thailand. 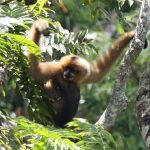 Gibbon experience is a rising star in the recent year and gains a lot of satisfaction from the visitors. Now imagine that you will live in a jungle, do a lot of hiking and trekking. You will have a chance to live in house tree on the top of the highest tree. 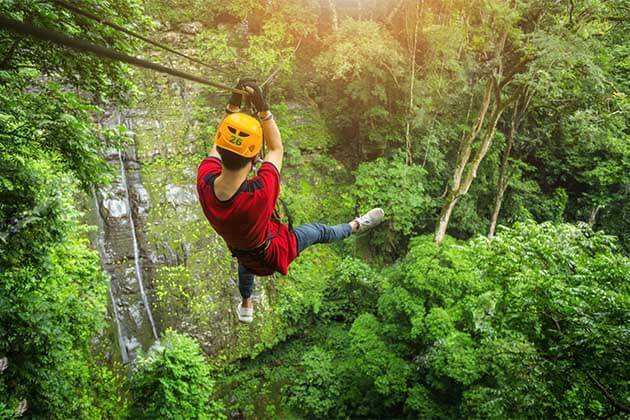 The method of transportation is by zip-lining, which offers you an opportunity to “fly” in the middle of a jungle in the fast speed and in the most adventurous way. A lot of hiking and trekking will give you a chance to feel the wildlife in the most surreal way. At night, you will hear like hundreds of rat screaming, a little bit scary but interesting. 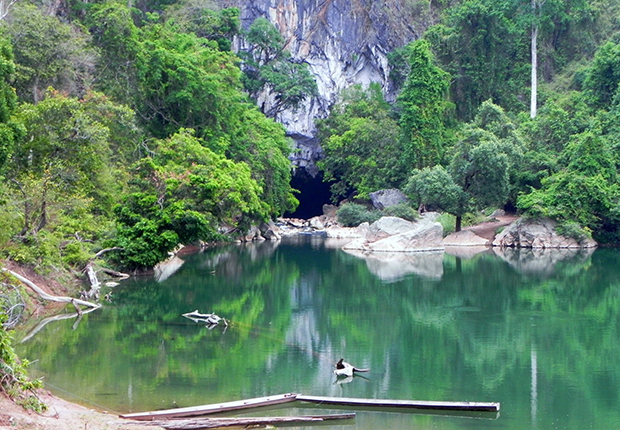 The land Kuang Si seems to be a very promising place for natural sightseeing. 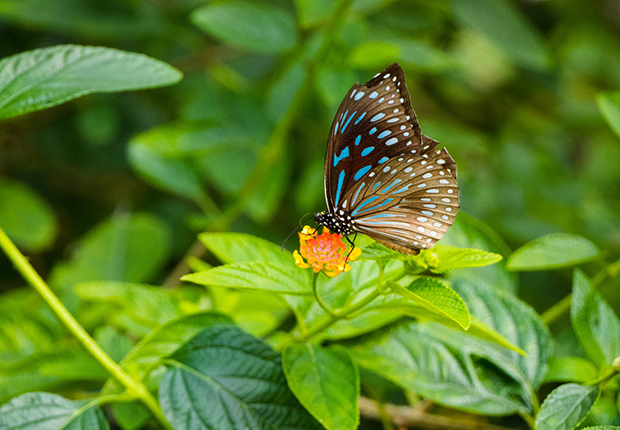 As having been mentioned above, we have hear about Kuang Si Fall and now is Kuang Si Butterfly Park, a project to raise the awareness of the importance of wildlife and nature. After paying entrance fee, you will get a short tour with the aim to learn about butterflies and local floral. And then it’s time for you to discover netted garden where is home of hundreds of beautifully colorful butterflies with many kinds of flower. And the most exciting part is here! Kuang Si Butterfly Park is offering visitors a natural “fish spa”. I am sure that you won’t be able to experience it everywhere in the world easily. The process is very simple: you are about to sit on a chair putting in a pond, your feet are immersed in the water with many tiny fishes, just let them nip at your skin or let the nature do its jobs! 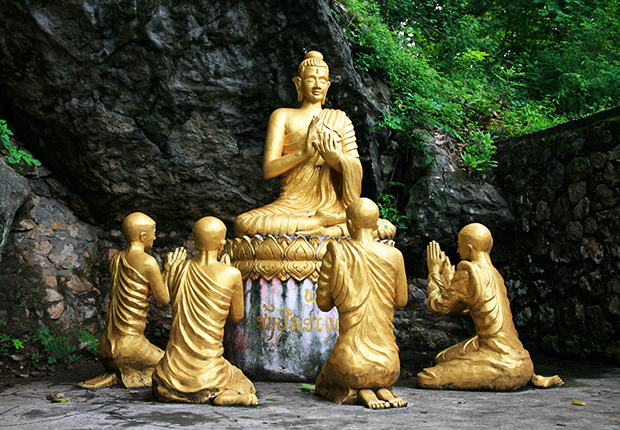 When mentioning about Laos, Mount Phousi is a popular site for every tourists and also convenient for transportation. Phousi is located in the central of the former capital of Laos, Luang Prabang. 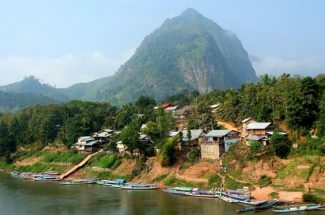 It is not the tallest mountain or the most majestic mountain in Laos, but the feature that makes it different from other mountain is its location. 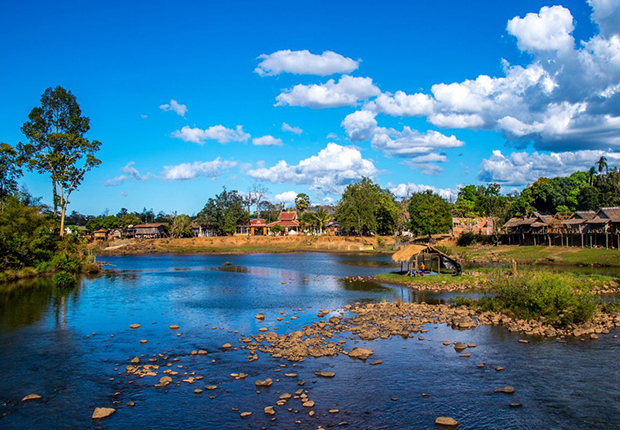 The mountain is bordered by Mekong River and Nam Khan River, which makes up the combination of water, high hill and religious building and the spectacular view of the city. Starting from the mountain base, you are about to take several steps to climb up to the mountain’s top. There are three ways leading to the top. 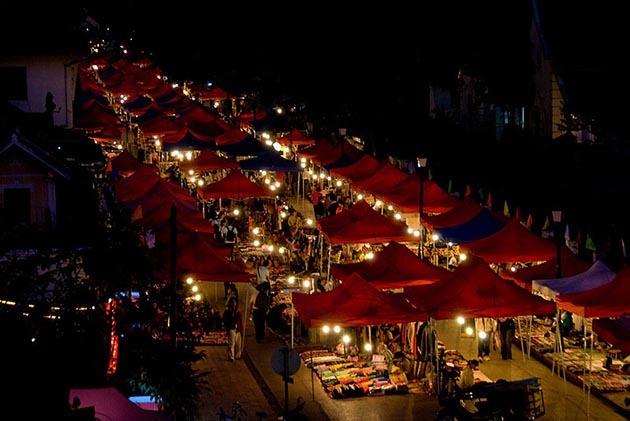 The first way is from Sisavangvong Road which is also the most popular and easiest, opposite the Royal Palace Routine. The second way is accessing from Kingkitsarath Road, but this one is from the other side of the mountain. Therefore, it is usually used for way-down. The last way is from Kitsalath Road which more zigzag and suitable for adventurous trip. When you have reached the top of the mountain, you will see sacred gilded stupa Wat Chom If and Wat Chom Si Temple. Also on the way up or down, you will encounter many gilded Buddha Statue in many different sizes and shapes. The most unique thing which light up your trip will be the chance to watch sun go down in Luang Prabang with 360 degrees view toward 2 rivers: Mekong River and Nam Khan River. The city is gradually fall into darkness, gives you a sense of relief and relaxing. Entrance Fee: 20000 for half way up. 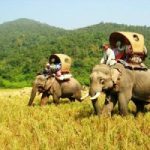 Elephant-riding is will be the most memorable experience for tourists in Laos. These elephants have been used in brutal logging industry for a long time as well as working for over 12 hours a day in very bad condition. Some of them are very old and even blind. 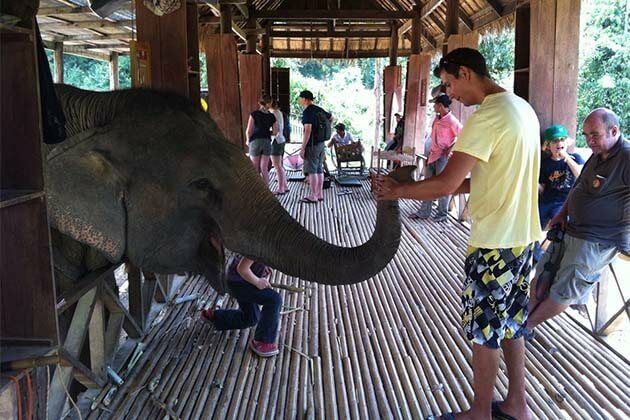 Therefore, the creation of Elephant Village in Ban Xieng Lom can be considered as a humanity act in order to help these miserable creatures and to offer them a better opportunity working in a friendly environment. You are about to play the role of a trainer. The locals will teach you how to control the elephant and guide them into the jungle. In the past, mahout has been once considered as one of the most admirable job in the society. There will be a lot of fun and excitement. Moreover, after taking an interesting elephant-riding and mahout experience, you can watch these giant animals bathing in the Nam Khan River. It can be considered as relaxing time after a long day. Since Kong Lor Cave is the longest cave in the country, the exploration trip will be a highlight in your journey. This karst formation cave is over 7 kilometers in length and is regarded as one of Southeast Asia’s geological wonders. The different between this cave and other is that there is a snakelike river with the width of 20 meters flowing through the cave. Therefore, in order to travel inside the cave, it requires a motorboat. Once you have already inside the cave, definitely, it’s time for you to be amazed at incredible rock formation and one more is the darkness inside the cave. Just imagine that you are going deep into a 7 kilometer cave with the darkness all over the day, there only some light spots from your torches, way-in and way-out. Tad Sae Waterfall can be regarded as a combination of Khuang Si Waterfall, Elephant Village and zip-lining adventurous tour. Located in Luang Prabang, Tad Sae is like a shorter version of Khuang Si Fall. It is not that giant or that high, but the water teems through multilevel of rock to get into the pool. Tad Sae is more preferable by locals so it is less touristy than Khuang Si Fall. And absolutely, you can freshen up in the water here as locals do. Since there are a lot of locals relaxing here, you should wear properly to avoid causing inconvenience for locals. 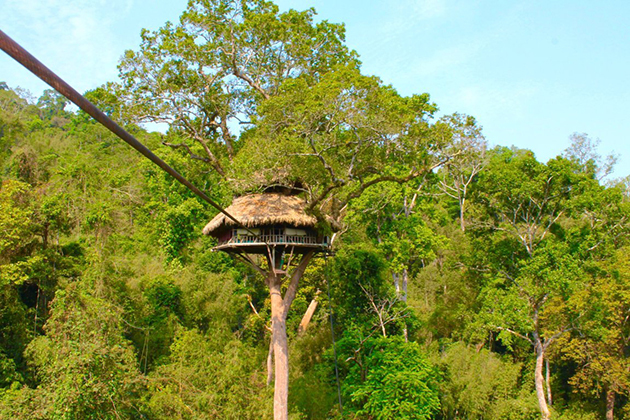 Moreover, the services also offer elephant-riding in the green crystal clear water and zip-lining adventure on spot. Only in Tad Sae, the tourists can do many activities for relaxing.